48 Commercial Real Estate and Properties in Sunshine Coast are listed in 9 categories. We have 320 Industrial Warehouses for Sale & Lease , 285 Retail Shops for Sale & Lease , 283 Offices for Sale & Lease , 60 Development Lands for Sale & Lease , 25 Hotels and Leisure for Sale & Lease and 17 Medical and Consulting Properties for Sale & Lease . Opportunity to secure an office warehouse with street frontage and potential for showroom. Ideally located in the Kawana industrial precinct, just off Nicklin Way and Kawana Way. + Up to 6.5 metres (approx) high clearance warehouse + Includes office of 40sq m (approx) fitted with ample power and data points + 3 phase power and LED lighting + Container high roller door with remote access + Excellent truck access with return driveway + Ample on site parking + Great exposure with street frontage Call or email Matt Marenko or Tallon Pamenter to inspect the property or find out about other suitable options. Our team is strategically located in two offices across the Sunshine Coast region and is ready to handle your commercial, industrial and retail property needs today so call or email now. Strategically Located - High Profile - Incredible Exposure $276,000pa + outgoings + .. This high profile showroom site was purpose built as a sales and workshop centre. It is strategically located on one of the Sunshine Coast's busiest arterial roads, with approximately 32,000 cars passing daily. + 5,640sq m site (approx) + 892sq m (approx) well appointed showrooms and executive offices across two buildings + 844sq m (approx) drive through workshop / warehouse with approximately 14 service bays + Ample hardstand, wash bay facility, air lines, waste oil separator + 1,300sq m (approx) outdoor sales / display area + 53 car parking spaces at rear + Zoned Medium Impact + 5 minutes to Bruce Highway, 10 minutes to the new Maroochydore CBD (times approx) Call or email Tallon Pamenter or David Smith to inspect the property or find out about other suitable options. Our team is strategically located in two offices across the Sunshine Coast region and is ready to handle your commercial, industrial and retail property needs today so call or email now. + NBN ready + Cost saving LED lighting through entire premises including LED high bays in warehouse + Alarm system installed + Security camera system installed, will be made available to tenant + New carpet, ceiling and lighting recently installed in upstairs office + Kitchenette with dishwasher and water filtration unit installed for drinking water + Large fridge space, microwave and storage in kitchenette + Separate break / meeting room with air conditioning installed and access from warehouse + 10 car parking spaces + All office areas air conditioned + Large air conditioned showroom + Due to expansion, the current tenant is moving to larger premises Amenities: Large kitchenette, upstairs office toilet, warehouse toilet and shower A rare find on the Sunshine Coast, this Kunda Park location offers a mix of office, warehouse and showroom. The warehouse and office facility has been used by an e commerce retailer during this period of their rapid growth. The warehouse enables double reach forklift usage supported by an office that can comfortably accommodate up to 15 staff. A separate Manager's and administration office ensures the privacy of business leadership for confidential discussions. The main office features air conditioning and louvred windows to filter natural light. There are blackboard painted walls to support productivity. Existing in ceiling speakers with ability to connect to amplifier or announcer. The kitchenette, bathroom and break room feature air conditioning, ceiling fans and window. The space is large enough to fit a couch, coffee table and medium sized meeting table if required. The showroom is secured by a lockable front door as well as a steel security swing door. The warehouse is secured by a manual lift roller door. If you are chasing exposure for your business then look no further. Situated on the main road as you enter Noosaville with neighbouring tenants Giant Noosa bike shop and iLove Computers which is a authorised Apple computer retailer this is a position which will not last long. 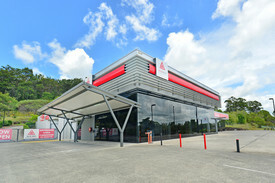 + 104sq m (approx) industrial / showroom tenancy + Ground floor tenancy + Excellent exposure to main road + Front and rear access + Open plan showroom area at front with delivery area / storage at rear + Bathroom and kitchenette + Air conditioned + Off street parking for customers + Situated directly across the road from Bunnings Warehouse + Available February 2019 Call or email David Brinkley to inspect the property or find out about other suitable options. Our team is strategically located in two offices across the Sunshine Coast region and is ready to handle your commercial, industrial and retail property needs today so call or email now. Land Area: 2,139m2 Office Area: 80m2 Zoning: Special Centre Zone Over 30,000 Vehicles Pass Daily Current Use: Car Sale Yard Site Benefits from Access Easement High Growth SE QLD Corridor High Profile Main Road Location Ideally Suited to Motor Dealership Rare Opportunity as Tightly Held For Sale: Submit All Offers For Lease: Contact Agent For more information or to arrange an inspection please contact Marketing Agents: Len Greedy 0401 691 807 len.greedy@raywhite.com Alan Gray 0414 894 084 alan.gray@raywhite.com Approx. 300m2 + potential for male/female toilets showers at an extra 25m2 Currently being occupied by Civic Video who have been in this location for a number of years Principal centre zoning which allows for a number of uses from office, retail, showroom and indoor recreation 15 onsite car parks + ample street car parking Exposure to over 20m of main road signage High growth location with Nambour being selected as a property growth hotspot in Australia (Hotspot Real Estate) Minimal outgoings with no body corporate Owners are motivated to find the right tenant This property is currently tenanted to Civic Video and has been for a number of years, it is an iconic location for Nambour and very visible from the main road with over 20m of signage available so no one will miss you as they drive into town. Nambour has become a real property growth spot and this property is an excellent position to capitalise on the heated market. Whether you are a retailer, professional service, personal service or a gym this property would be perfect for you with the owners really flexible and motivated to work with the right tenant. For further information or to arrange an inspection, please contact Emily Pendleton on 0402 435 446. This high profile property on Caloundra Road will suit a wide range of business operations. It comprises a modern air conditioned showroom with offices, rear workshop and display yard all securely fenced. Rarely properties become available in this location and an opportunity to profile your brand in a high growth corridor. Land area: 2198m2 Building Area: 1060m2 Showroom, workshop, storage shed and display yard Main road location with high volume of passing traffic Tiled, air conditioned, well lit showroom Security fenced with front display yard and rear storage area Suit a range of business operations including major retailers For Lease: $205,000pa + GST (Outgoings Included) For more information or to arrange an inspection please contact Marketing Agents Len Greedy 0401 691 807 Len.greedy@raywhite.com Alan Gray 0414 894 084 Alan.gray@raywhite.com Approx. Opportunity to secure an office warehouse of 206sq m (approx) ideally located in the Kawana industrial precinct, just off Nicklin Way and Kawana Way. + High clearance warehouse up to 6.5 metres (approx) + Includes office fitted with ample power and data points + 3 phase power and LED lighting + Container high roller door with remote access + Excellent truck access with return driveway + Ample on site parking Call or email Matt Marenko or Louisa Blennerhassett to inspect the property or to find out about other suitable options. Our team is strategically located in two offices across the Sunshine Coast region and is ready to handle your commercial, industrial and retail property needs today so call or email now. 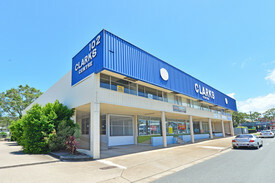 Located in the heart of Noosaville's premium industrial and business area. The showroom approved space offers an opportunity for a high end dealership or multiple other commercial operations (STCA). Currently owner occupied by prestigious Eurobikes Noosa with an option of short term lease back or vacant possession within two months. + 353sq m (approx) showroom in three unit development + Fully air conditioned showroom + Includes reception and small office plus separate workshop + Features include sealed floors and floor to ceiling windows on two sides of the building + 11 on site car parking spaces Call or email Tracey Ryan or Paul Forrest to inspect the property or find out about other suitable options. Our team is strategically located in two offices across the Sunshine Coast region and is ready to handle your commercial, industrial and retail property needs today so call or email now. This industrial unit in a highly visible complex has a total space of 222.5sq m (approx) and is comprised of an office, mezzanine and warehouse. Close proximity to CBD, Sunshine Motorway and easy access to the Bruce Highway. + 22.5sq m (approx) ground floor air conditioned office with glass front + 60sq m (approx) mezzanine with air conditioning and ample natural light + 140sq m (approx) warehouse + Kitchenette, toilet and disabled toilet + Rear automatic roller door + One allocated car parking space Call or email David Smith to inspect the property or find out about other suitable options. Our team is strategically located in two offices across the Sunshine Coast region and is ready to handle your commercial, industrial and retail property needs today so call or email now. 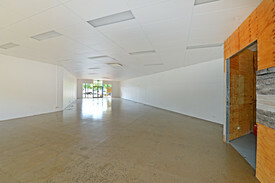 140m2 Clear span warehouse High clearance roller door Quality amenities finishes throughout Insulated roof, keeping the shed cool in the warmer months Located within clean tidy, secure, gated complex Affordable rental in quality estate Located within the popular Coolum Beach Industrial Estate is 159m2 of brand new clear span warehouse for lease. The complex is secure with fencing and presents as a modern, clean tidy small strata titled development. It is located minutes to the Bruce Highway Sunshine Motorway and in close proximity to the Sunshine Coast Airport. Contact the exclusive marketing agents for more information or to arrange an inspection. Brand new industrial complex of 12 with a mix of office warehouses from 192sq m to 413sq m ideally located in the Kawana industrial precinct. + Only four new units remaining, each with high clearance of 6.5 metres (approx) + Unit 2: 192sq m Unit 3: 207sq m Unit 11: 206sq m Unit 12: 207sq m (sizes approx) + Container high roller door access + Two wide driveways and ample parking + 3 phase power and LED lighting + Includes offices with ample power and data points + Potential for mezzanine storage Call or email Matt Marenko to inspect the property or find out about other suitable options. Our team is strategically located in two offices across the Sunshine Coast region and is ready to handle your commercial, industrial and retail property needs today so call or email now. Brand new 192sq m (approx) warehouse ideally located in the tightly held Kawana industrial precinct. + Up to 6.5 metres (approx) high clearance warehouse + Includes office of 23sq m (approx) and fitted with ample power and data points + 3 phase power and LED lighting + Container high roller door with remote access + Excellent truck access with return driveway + Ample on site parking + Provision for 23sq m (approx) mezzanine Call or email Matthew Marenko to inspect the property or find out about other suitable options. Our team is strategically located in two offices across the Sunshine Coast region and is ready to handle your commercial, industrial and retail property needs today so call or email now. Flexible Zoning; Specialised Centre Zone 3 Exclusive Undercover Carparks Roller Door Glass Sliding Door Access 280m2 Total Space 195m2 Ground Floor Bonus 85m2 Air Conditioning and Carpeted Mezzanine Positioned in the well established and popular central Maroochydore location of Sugar Road, the opportunity has presented to lease this clean industrial shed. Make the best use of the flexible Specialised Centre Zoning which would appeal and suit a variety of businesses ranging from industrial to indoor recreation, the zoning is only complimented by the convenience of quick and easy access to the recently extended Sunshine Plaza, Sunshine Motorway and Bruce Highway. Contact our marketing agents today to discuss further or to arrange an inspection. Large Shed For Lease With Good Access $35,000 pa inclusive of O..
A rare opportunity to obtain a commercial space with a quality fit out as a dance studio. + 510sq m (approx) ground floor retail or office space + Fit out ideal for group fitness / yoga / pilates / dance studio + Highly versatile with side, rear and roller door access + 9 allocated parking spaces and ample on site parking + Potential to be reinstated back to an office or retail space + Exposure to major traffic flow + Specialised Centre zoning Call or email David Smith to inspect the property or find out about other suitable options. Our team is strategically located in two offices across the Sunshine Coast region and is ready to handle your commercial, industrial and retail property needs today so call or email now.